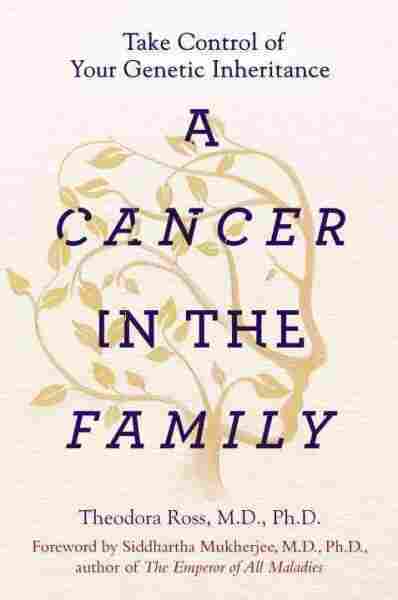 A Cancer in the Family NPR coverage of A Cancer in the Family: Take Control of Your Genetic Inheritance by Theodora, M.D., Ph.D. Ross and Siddhartha, M.D., Ph.D. Mukherjee. News, author interviews, critics' picks and more. An authoritative reference for people facing a genetic predisposition to cancer draws on the author's experiences as both an oncologist and genetic melanoma survivor to explain how to identify risk patterns, obtain testing and make informed decisions without fear. At any given moment, thirteen million people in the United States have cancer. For each of those thirteen million, there are family members who are wondering: Is this cancer part of a pattern? Does cancer run in my family? Am I at risk? If you are asking these questions, you are in the same shoes I stood in. If you are like me, you may be frustrated that the rest of the world believes you have a clear path ahead of you. Take a family medical history, talk to your doctor, get tested if necessary, get a definitive answer. As you may have already discovered, it’s not that easy. I spent years training in both science and medicine—with a specialty in cancer—and even I found that these steps are far more complicated than they seem. Cancer is a big, unwieldy topic; so is genetics. There’s so much to get your head around and so many possible obstacles in your path. Some of those obstacles are pretty close to home. For example, there’s a general feeling that a person who’s worried about a cancer mutation should “just get tested.” It’s a simple concept in theory, but the reality is more complicated. Although it’s possible to get an over-the-counter genetic test on your own, the labs that perform these tests are forbidden by law from interpreting most of the results for you. The law is there to protect you against interpretations that are inaccurate or lead to actions that are harmful. An over-the counter lab can tell you that you have a possible mutation in a particular gene, but you wouldn’t know whether that gene variation is harmful or benign, or whether it’s a variation whose significance is not yet known. (As I’ll explain later in the book, the vast majority of rare genetic variations from what we consider “normal” are harmless, and there are many, many mutations we don’t yet understand.) If you don’t know what a genetic change means, you don’t have a very helpful piece of information; you just have a bunch of numbers and letters on a page. For that reason, it’s far better to work through a doctor or a genetic counselor. But one of the most counterproductive things you can do is send your blood to a lab, or let your doctor send your blood to a lab, without first understanding what syndromes and mutations you’re most likely at risk for. These labs analyze the genes that are most likely to be mutated, which varies from person to person; without accurate knowledge of your family history, you could easily end up getting the wrong test—and, possibly, a false sense of security. To determine what genes are most likely to have mutations, you (along with a genetic counselor) need to be able to spot the patterns common to familial cancers. Even if you already know that you have a mutation, it’s important to get a family history. A family history helps predict the risk of a mutation in any particular individual. Without a family history, you may know that you have an increased risk, but you may not know whether your risk is on the high end, the low end, or somewhere in the middle. That information—where you fall in the range of increased risk—can affect the choices you make about how to protect yourself. For these reasons, you need a family health history that is as thorough as possible. Taking a family history sounds like a neatly defined task. Until you run into family members who lie to you or who make it emotionally perilous to discuss health issues. At first this concern can sound outdated. Cancer secrecy? Cancer shame? In the twenty-first century? It’s been forty years since Betty Ford announced that she’d had a mastectomy. Two decades since the first cancer-awareness ribbon fluttered. More than a decade since Katie Couric’s colonoscopy was broadcast live. And eight years since Merriam-Webster named “oversharing” its word of the year. It’s been a long, long time since “cancer” was a word that made nice ladies blanch and gaze down at their shoes. And yet. We do keep secrets about cancer, and it’s incredibly common to run into other problems—vagueness, bad information, bad feelings, legal issues—that keep people from understanding their risk. In addition to now happily researching the normal and abnormal biology of BRCA and other cancer genes in the lab, I work with a team of counselors and high-risk cancer patients of all kinds. Every day we see patients who are blindsided by a diagnosis of inherited cancer. These are people who have already missed their chances for early detection and preventive treatment. Now they’re scrambling to learn enough about their histories to determine if they are at risk for future cancers—and to write an accurate history for the next generation. Some examples: A young woman is surprised when she develops ovarian cancer, apparently out of the blue; she then learns that her aunt also had ovarian cancer in early adulthood but had been so embarrassed that she didn’t tell anyone about it. A son gets colon cancer at twenty and finds out the man he’s always thought was his father is not, in fact, his biological father, and that his bloodline father died of colon cancer—also at age twenty. Another family doesn’t realize that they have a significant history of prostate cancers. That’s because some branches of the family refuse to speak to other branches; no one has put together the full medical history. In my own case, my family had no serious estrangements, and our worries about cancer actually pulled us closer together. Yet somehow we had unwittingly spread half-truths about our family history, carried secret histories about our ancestry, and ignored our best instincts when those instincts were inconvenient. (I was especially guilty of that last charge.) We weren’t the only ones to participate in the concealment of our inheritance. Along the way, doctors and researchers helped us keep the truth from ourselves. There was no conspiracy here—just a human tendency to avoid pain and awkward discussions. When you’re looking for patterns that suggest inherited mutations, this kind of misinformation can send you miles down the wrong path. Difficulty figuring out the family history is the rule, not the exception. What about getting cancer information from the Internet? What sounds like a good plan is actually an exercise in frustration. You can’t Google your way to an understanding of family cancer. The few sites and pages that specifically address family cancer don’t tell you what you really need to know. “Get counseling,” they chirp. “Get tested!” But they don’t offer thorough information about the nature of hereditary cancers and the kinds of patterns that can alert you to the possibility that a cancer syndrome is being passed down through the generations of your family. For example, there’s a lot of chatter online and in doctors’ offices about mutations in BRCA1 and BRCA2, the breast cancer genes. But there are other mutations that can lead to breast cancer—and BRCA mutations can lead to more than just breast cancer. Also, they can affect both men and women. So if your father has had prostate cancer and your uncle has been diagnosed with melanoma, you may carry a BRCA mutation—even if you’re a man. Both men and women with BRCA mutations are at risk for a variety of cancers, and so are adult children who inherit a broken BRCA gene from their parent. But most websites and other public sources of information offer a more limited view. In the pages to come, you’ll get the details you need to investigate your family’s patterns and understand what you find. Not knowing about a genetic predisposition to cancer, or not understanding the significance of that predisposition, matters. It matters because there is so much good to be discovered in that knowledge. As I found, learning your genetic inheritance may feel daunting, but in the end it can give you a sense of release, an ability to go out into the world with less fear and more confidence. It grants you the power to make lifesaving decisions, both for yourself and for the generations to come.